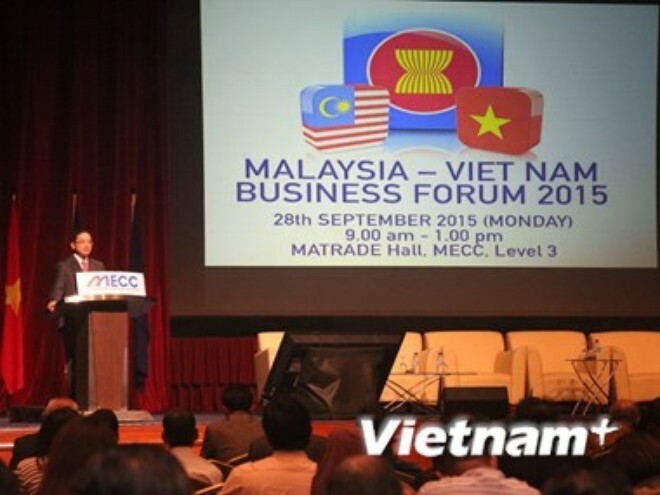 KUALA LUMPUR (VNS) — The Malaysia-Vietnam Forum 2015 was organised in Kuala Lumpur yesterday with the objective of providing information about Viet Nam's business and investment environment. Jointly organised by the Malaysia External Trade Development Corporation (MATRADE) and the Viet Nam Trade Promotion Agency, this year's event attracted the participation of over 300 Malaysian entrepreneurs, exporters and investors. Speaking at the event, MATRADE Chief Executive Officer Dzulkifli Mahmud said that with a population of 90 million, Viet Nam was considered a potential market for ASEAN's trade and investment activities. Strong economic and trade ties between Malaysia and Viet Nam had been a catalyst to boost bilateral relations over the past years, he stated. According to him, two-way trade reached US$9.04 billion in 2014. In the first seven months of this year, Malaysia exported goods worth $2.61 billion to Viet Nam, while importing $2.79 billion worth of commodities from the country, up 9.1 per cent and 1.2 per cent, respectively, from the same period last year. Malaysia is now Viet Nam's eighth biggest investor with a total capital of $10.7 billion. He expressed the hope that through this forum, there would be more and more Malaysian enterprises interested in doing business in Viet Nam, thus helping to promote trade between the two countries. Vietnamese Ambassador Pham Cao Phong said that Viet Nam had recorded an annual growth rate of 6.8 per cent in the past 15 years, and was exerting efforts to complete the market economy institution, improving its competitiveness, and expanding its trade ties with other countries. He proposed establishing a Malaysian-Vietnamese Entrepreneurs' Association in Malaysia. Meanwhile, director of VIETRADE's Export Development Department Tran Minh Thang briefed participants on Viet Nam's economic situation, business and investment environment, as well as opportunities and challenges when doing business in the country.